Booleans are extremely useful and common. They may be used to indicate whether some condition is met, should a device be on or off, did some operation succeed, etc. Let’s learn how boolean values can be combined. Read the descriptions for and, or and not nodes. Guess what the output value of and will be. Run the simulation to confirm it. 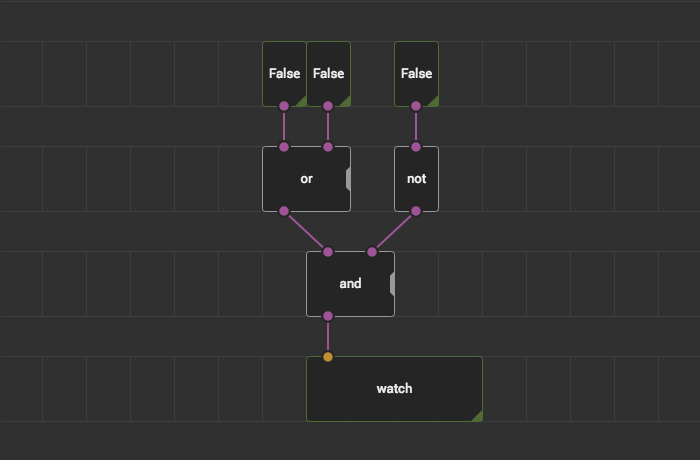 Use tweak-boolean nodes to change it to the opposite value. Check out descriptions for nand, nor and xor nodes. Add them onto the patch along with some additional tweaks to make a more complex processing. If one would use binary sensors like buttons or mechanic switches as a source of boolean values and relays instead of watches, he can use XOD to program PLC devices resembling the ladder programming which is common in industrial applications.